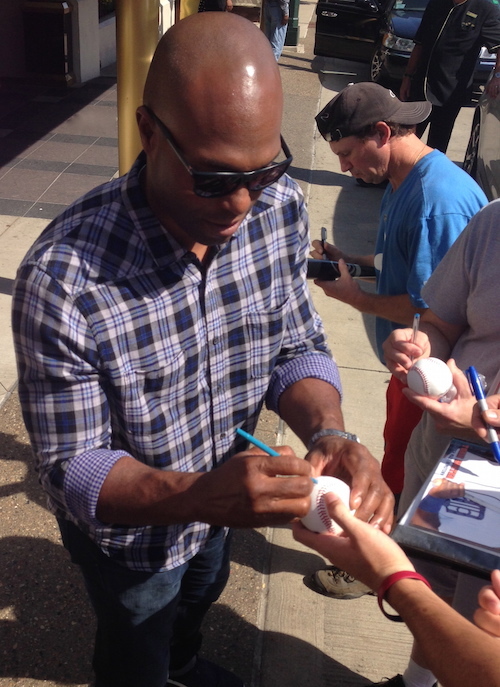 Above is an iFolloSports.com original photo of longtime MLB star Torii Hunter signing autographs outside a Detroit area hotel. The picture was gathered by iFolloSports.com Michigan based correspondent Lance Martinez. Hunter just completed his 19th and perhaps final MLB season with the team he started with, the Twins. In 2015, Hunter hit 22 home runs and drove in 81 runs. After beginning his career in Minnesota, Hunter’s baseball life included stints with the Angels and Tigers, before returning to where it all began. The five-time All-Star and nine-time Gold Glove winner has always been a fan favorite, with iFolloSports.com posting several original stories of Hunter taking care of his fans over the years.